Angry Birds HD Is Simply Stunning! No problem, take your time…we were a bit wordy? Alright, let’s get down to business. 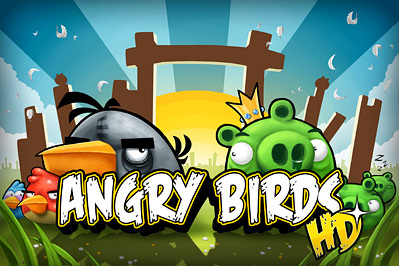 With Angry Birds HD we gain a graphically optimized version of the original hit game. All content is exactly the same, controls have been left alone (as they should be..) and nothing exclusive has been added. Is that a bad thing? Not in my book, this game is fantastic in its own right. Aside from the higher resolution graphics, the biggest change in this iPad-exclusive HD version is the additional screen space added thanks to the size of the iPad’s gorgeous screen. While this may not seem like a huge deal, it certainly adds the ability for additional strategy. The pinch to zoom in/out function allows us to see the entire playing field of a given level. It doesn’t add a whole lot, simply a bit more depth on some levels, but this can come in quite handy when aiming your birdies. The game’s visuals, as I stated have received the “HD” treatment and it’s quite noticeable. Zooming in as much as you can reveals extremely clean and polished graphics. It’s an absolute treat to play this amazing game on either your iPad or iPhone/Touch and I fully 100% recommend that everyone buys this game, you wont be let down. This game is every bit as fantastic as its iPhone/iPod Touch counter-part. While the enhanced graphics and additional screen real estate don’t change the gameplay, they do however add to it and make the Angry Birds experience that much better. You can follow Wil on twitter at @wilwired.